Shares of Russia's largest commercial broadcaster are priced at double what they were during the company's IPO. In a sign of the growth potential of Russia's advertising market, Alfa Group has slapped a $1 billion price tag on its stake in the country's largest commercial broadcaster, CTC Media. 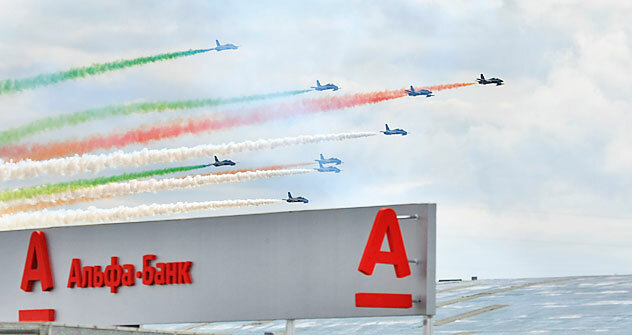 Alfa, Russia's leading financial-industrial conglomerate, said on Apr. 28 that it is in talks to sell its 25.3 percent stake in CTC (pronounced “S-T-S” – the company uses the Cyrillic version of its name in print) to Russia's National Media Group, but has first offered the stake to fellow shareholder Sweden's Modern Times Group at a price of just over $27 per share, or $1.07 billion That’s almost double the cost of the shares during the company’s IPO in Summer 2006. Modern Times has until May 25 to respond, although analysts say it's unlikely that the Swedish firm will acquire Alfa's stake; Russian legislation restricts the stake held by foreign investors in television companies to 50 percent, and Modern Times already holds 38.3 percent of CTC shares. This is unfortunate for the Swedes, because CTC CEO Anton Kudryashov claims that CTC is not only the most successful commercial TV company in Russia, but the most profitable media company in the world. Additionally, the company looks set to benefit from an expected surge in advertising spending in Russia over the coming years. "In terms of ad spend, Russia is already the ninth biggest market in the world, the fifth largest in Europe and, if current growth continues, it will be the largest in Europe as soon as 2013," said Kudryashov in an interview just before Alfa announced that it is looking to sell its stake. Television is by far the most important media channel in Russia. TV sets remain the primary source of news and entertainment for millions of Russians living in far-flung regions, and the only way that multinationals can cost-effectively sell their fast-moving-consumer-goods to the country’s entire population. As a result, while TV advertising typically accounts for a third of a company’s total ad budget in the West, in Russia, half of every ruble spent on advertising goes to TV ads. Russia's total ad spending in 2010 was $4.2 billion and has been growing by 25-30 percent a year. The crisis took the edge off this ballistic growth, but Kudryashov believes it will have recovered all the ground lost by the end of this year. And there's still a lot of room to grow: In the West, the total amount of GDP spent on ads is typically equivalent to 1.0-1.5 percent. Spending in Russia spending hit a peak of 0.7 percent in 2008, but fell back to 0.5 percent in 2010. "The Russian market is large in size, but still immature in nature," Kudryashov said. "In the West, cars and financial services are among the top-five biggest spenders, but in Russia these products only account for 2 percent of the total spend—of course this will be a major source of growth as these areas develop." All this makes shares in CTC a valuable proposition. Nadeem Moulvi, an equity research analyst, picks CTC as one his top-10 growth stocks. He says the company should grow its profits at an annual rate of 60 percent compared with the 19 percent growth rate of the wider U.S. broadcasting and cable TV industry. The company is debt free and has maintained a net profit margin of 24 percent during the past five years, he said. CTC began life as a small broadcaster in St. Petersburg in 1994 and only went nationwide in 1996. Things started to move fast for the company when Modern Times bought out the founders in 1999 and, in 2003, brought in Alfa. This investment cycle culminated in an IPO on Nasdaq in 2006 that raised $200 million, providing the funds for a rapid expansion and a string of acquisitions including two more broadcasters – Domashny, the only channel in Russia to specifically target women, and DTV, which specializes in reality TV–as well as some production companies to produce content in-house. CTC focuses solely on entertainment, broadcasting a mix of domestically produced content—which makes up two-thirds of its programming—and international shows. It targets viewers aged 6–54, especially younger audiences. Kudryashov said the station made a conscious choice to carry no news or socially orientated programming. "News is not dangerous, but it does require a lot of coordination with the supervising authorities," said Kudryashov. "News is expensive, as you need a big staff. The state can lose money on news production; we can't." While it's hard to compete as a news broadcaster, it is easier to cater to the demand for pure entertainment. With its in-house production and extensive market research, CTC has a market advantage that allows it to capture advertising spending. This is a crucial advantage in Russia's highly competitive TV market. There are 20 free-to-air channels, but the top five account for 68 percent of the audience share and 80 percent of the advertising revenues, said Kudryashov. By 2003, the broadcaster had built up an 11 percent audience share. Taking into account its small channels, CTC is the third or fourth largest channel in the country, reaching over 100 million people and nine out of every 10 households. The channel’s main challenge has been keeping up with the changing tastes of Russia's viewing audience. A year after the Soviet Union collapsed, a wave of Brazilian and Mexican soap operas appeared on Russia's airwaves and were a smash hit; shows like Mexico's telenovelas "Simply Maria" and "The Rich Also Cry" could clear the streets of Moscow during a particularly dramatic installment. These days, tastes have become more sophisticated, said Kudryashov. CTC either makes or buys two-thirds of its content domestically; the rest is made up mostly of Hollywood blockbusters. Many of the home-grown shows are adaptations of successful formulae developed overseas and transposed into a Russian cultural setting. For example, CTC owns a license to produce the sitcom "Born not pretty" based on a popular Colombian telenovela that is better known as "Ugly Betty" in the West. "Nowadays, there is more and more demand for original Russia-produced content, but the problem is where to get it from. Production is not mature and there are not enough writers to create the content needed to meet the demand," said Kudryashov.